Alzheimer’s disease is a minefield for drug developers. Despite billions of dollars invested by biotechs and pharmaceutical companies, a number of programs have blown up in clinical testing over the past decade. Can a star CEO march the rechristened Forum Pharmaceuticals through that treacherous terrain? Since July 2013, Forum has been helmed by Deborah Dunsire, who once led Millennium Pharmaceuticals as it brought its blockbuster multiple myeloma drug bortezomib (Velcade) to market. And now, even as Forum is running two massive, expensive Phase 3 trials, Dunsire is trying to make big changes. Dunsire (pictured above) told Xconomy recently that Forum is branching out from its longtime sole backer, a unit of the money management giant Fidelity Investments, and charting a new financial course. 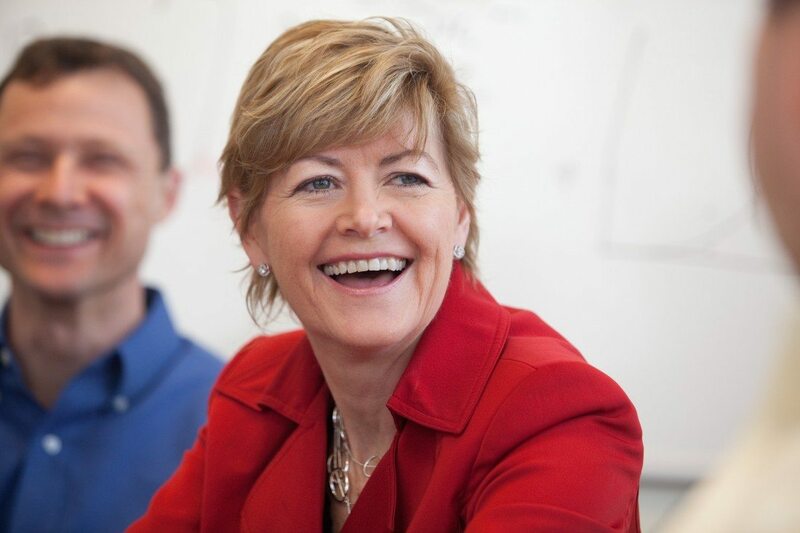 The exact plan is fluid—Dunsire says Forum is meeting with bankers and evaluating its options—but the Watertown, MA, startup now wants other investors to join Fidelity Biosciences, the biotech VC arm of Fidelity, and Forum’s only shareholder since 2008. It’s also eyeing an initial public offering that could come in 2016, Dunsire says, perhaps after unveiling data from the first of two late-stage trials—one in Alzheimer’s, one in schizophrenia—for its lead drug candidate, an experimental cognitive enhancer called encenicline. Dunsire says there are two main reasons for this major shift. First, in forming the strategic plan for Forum going forward, she crunched the costs to finish the current Phase 3 trials, and amass sales forces here and abroad. She presented them to Fidelity and urged caution: “I said I’ll do whatever you believe is best, but I want to tell you, I’m not sure you should have such a concentrated position,” she says. Second, a generational shift is underway at Fidelity. Edward “Ned” Johnson III’s daughter, Abigail, succeeded her father as CEO of the firm in October. Abigail has a different investment strategy than her father, Dunsire says, and isn’t as keen on the idea of “owning and operating a pharmaceutical company.” Says former CEO Kees Been, who ran the company from 2005 to 2013, Ned wasn’t just incredibly passionate about “anything related to neurodegeneration,” but was known to make bold, contrarian investment bets. Many other drugs have crashed and burned in big, costly neuroscience trials. Attempts to fight the underlying cause of Alzheimer’s, a devastating memory-robbing condition affecting millions around the world, have all failed. The only successes are donepezil (Aricept) and memantine (Namenda), that, like Forum’s experimental encenicline, are cognitive boosters, meant to help people think more clearly. But even those drugs help only a fraction of patients for a short period of time, and often lead to problematic side effects. With so much unmet need, the prize for providing even temporary symptomatic relief is significant. For all their flaws, donepezil and memantine have generated billions of dollars in sales. Should encenicline persevere in either Alzheimer’s or schizophrenia, where there aren’t any drugs approved for cognition, Forum could receive a windfall. “And if it can work in these two disparate diseases, there are a lot of other ones where cognition is impacted,” Dunsire says. That’s been the quest of one of the richest men in America, Ned Johnson. The story starts in 1984 when Johnson’s’s father, Fidelity founder Edward Johnson II, died from Alzheimer’s, and Ned became an advocate for funding Alzheimer’s research. Through its charitable foundations, for instance, Fidelity launched in 1996 the Alzheimer Research Forum (alzforum.org), a non-profit online resource base for Alzheimer’s research information. (The forum is owned and operated by a Fidelity subsidiary and based in Fidelity’s Cambridge headquarters.) The Fidelity Foundation has also put millions into academic research. “This was based on a wealthy man’s passionate, dedicated investment in something that was, of course, very near and dear to his heart,” Been says. That longstanding interest became a commercial bet in 2001 when Fidelity founded a life sciences venture unit, Fidelity Biosciences. Atlas Venture partner Jason Rhodes was Fidelity Biosciences’ first employee.